If you have horses, you have flies! 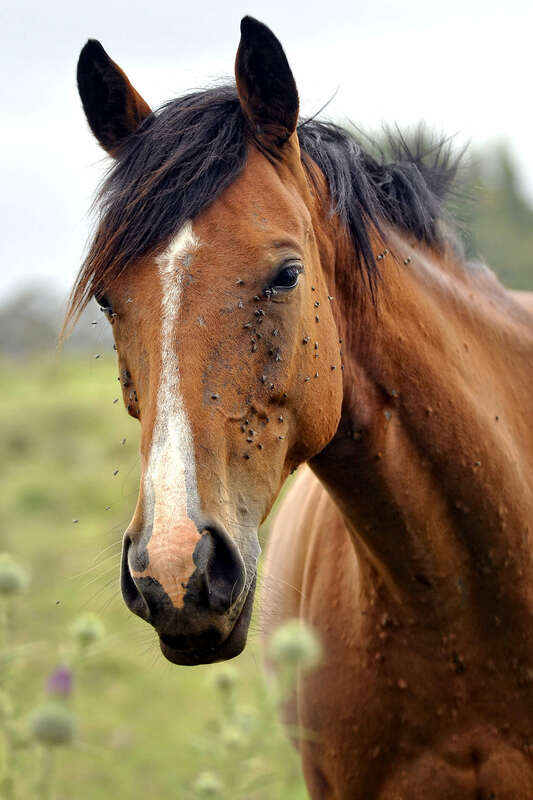 Flies and other biting insects are constant pests that irritate both horses and riders, especially in the summer months when weather conditions create the perfect breeding ground for flies. These pests can also pose a major health risk with their ability to transmit diseases. 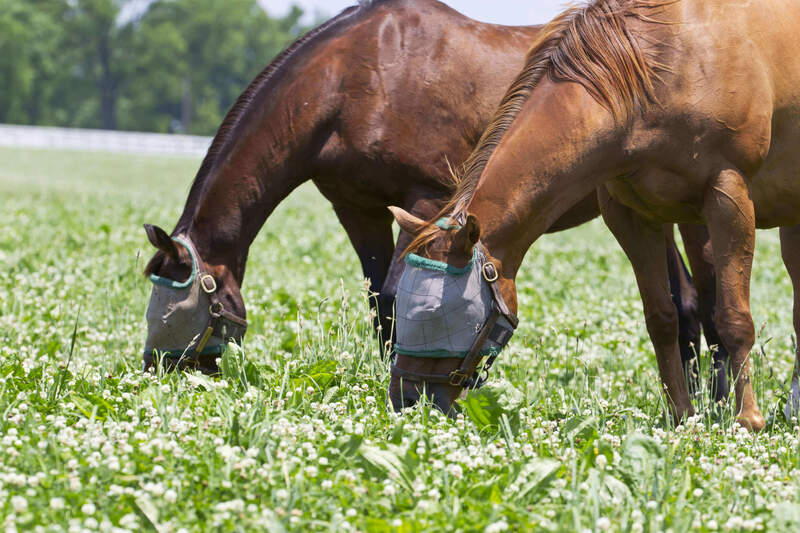 Flies live, feed and breed in filth where germs, bacteria and transmissible diseases thrive, which is why fly control is such an important part of every horse care routine. There are numerous fly species in the U.S., and although nearly all can be aggravating to horses, there are a few that have been identified as particularly pesky. Here are some helpful tips to aid in recognizing which flies are present on your property and the risks that each fly poses. Stable fly: Stable flies have one of the most painful bites of any bloodsucking insect. They tend to bite horses' legs and flanks, which causes the horse to stomp. These flies are most active in the daytime, breed in old manure or other wet, decaying matter and can travel in a range of up to 100 miles. They may also transmit equine infectious anemia (EIA). Horse fly: Horse flies are most common in or near swampy areas. They are persistent biting flies that attack the withers, legs, chest and neck of the horse. They are most active during the daytime and may transmit EIA. Horn fly: Horn flies concentrate in pasture areas and breed in fresh manure piles. These biting flies are present during the daytime, attacking the chest and underbelly of the horse. Smaller than many other fly species, horn flies may cause midline dermatitis. Face fly: Face flies have an appearance similar to house flies, but are non-biting nuisance flies. They can be found on the face around a horse's eyes, nose or any open wound. Face flies are most active during the daytime, north of the Mason–Dixon Line. They feed on tears, mucous and saliva, and can transmit pinkeye and horse eye worms. House fly: House flies are the most common fly and the toughest to repel. This nuisance fly is found around humans, breeding in disturbed manure and garbage. The house fly is known for spreading germs and disease. Gnats or punkies: Also known as "no-see-ums" for their tiny size, these biting pests attack thinly haired areas, typically inside the ear, and leave bloody, crusty spots. They can be found at dusk near stagnant water, mucky ponds or marshes and may transmit African Horse Sickness. Ticks: Ticks are biting, bloodsucking pests that feed on animals, typically around the legs, ears and tail head. These insects may transmit a number of diseases, including Lyme disease. Mosquitoes: Mosquitoes are bloodsucking insects that are most prevalent at dusk. They breed in standing water and may transmit potentially fatal diseases such as Equine Infectious Anemia, Equine Encephalitis or West Nile Virus. What's in a Fly Spray? All fly sprays are not created equal. Some fly sprays contain multiple active ingredients for a quick knockdown and repellency, providing a barrier that prevents flies from attacking horses before they land. Others contain natural ingredients, skin conditioners or sweat-resistance properties. Before using a fly repellent, always read the label to find the one that works best for your needs. Pyrethrins: Pyrethrins are natural insect repellents derived from the chrysanthemum flower. They're considered one of the best vapor repellents, and pyrethrin-based fly sprays, like the Horse Health Ambush Insecticide & Repellent, can create vapor barriers that prevent flies from landing and feeding on the horse. Permethrin: Permethrin is a contact repellent that provides a "hot foot" action to repel and kill insects after they land. Permethrin is a synthetic pyrethroid that won't break down in sunlight, making it last longer than pyrethrins alone. Piperonyl Butoxide (PBO): Piperonyl Butoxide acts as a pesticide synergist, working to improve the activity of other active ingredients in the fly spray. It prevents the flies and other pests from metabolizing the pyrethrins and permethrin, increasing their effectiveness. Citronella oil: Citronella oil is a natural essential oil that repels flies while providing a pleasant scent. Fly sprays that contain these active ingredients can play an important role in fly control. When used as directed, fly sprays can be effective in reducing irritation and the risk of diseases transmitted by flies, and should be considered as a component of horse owners' fly control regimen.